I try to give my sons the most complete picture of the human experience I possibly can. Often, I try to give them a sense of how the world has changed since I was a kid -- not so much in terms of "how much better" it was back then (it wasn't) but simply in terms of how simply different it was. I think it might be impossible for them to fully understand having known only what they know, the same way it was impossible for me to fully understand my parents' youthful years. Yeah. I am. I just am. No judgement or curmudgeonly argument about how much better things were. No "golden age thinking." I really just am grateful for it. As with many topics I address, this is not about saying what should be or to point out how horrible things are now. (They really are not horrible and I'll bet my kids look back fondly on their childhood days, some day...) It's just that I am what I said I am: grateful. I am grateful I had to wait for an entire year to see The Wizard of Oz on TV. I'm glad I had to be in front of that TV at a certain time on a certain night to see the Charlie Brown Christmas special, each year. I am glad I had to buy a record album and that, since it was one of the few I could afford, I listened to it until I had squeezed every drop of juice out of it while I saved for another. I am glad that, on Saturday mornings, I had to sit and wait until ten o'clock (for some reason, I had decided that was a good, polite time to calla house phone) to call a friend to play (I still remember my good friend George's number, even though I haven't seen him in decades) and I am glad I had to do it on a rotary phone in the kitchen and that I could not be contacted twenty-four hours a day on a cell phone. And I am glad that I met George at the baseball field on summer days and that we just waited for people to show up for a game; I'm glad that sometimes not enough people showed up and that, if "closing right field" was not enough, we wound up making forts in the woods instead, gloves left on the pitcher's mound, unmolested until it was dark and time to go home. I'm glad that when a teacher talked of China or of Ancient Egypt in class that the images she showed us in a filmstrip were not something we had already seen on our phones after a millisecond search; I'm glad our eyes went wide as we learned of places and cultures too far to see and too expensive to visit. I'm not glad that discrimination of those in the minority (socially or ethnically) was far more prevalent, but I am glad that my young mind could explore wonders and dreams instead of having been constantly bombarded by arguments over the rapidly shifting parameters and mores of social boundaries. Yes, protests happened and marches occurred and debates turned ugly, but I saw them in a two minute news spot; I wasn't standing always in the middle of them like a tree being choked with ivy. I am glad that girls were mysterious to me and that a kiss was a big deal. I'm happy that "waiting until marriage," although it didn't apply to most people, hadn't yet become a punchline. Most of all, I am glad I had time -- time to do nothing but lie in the grass or to draw pictures or to see what happened when I hit combinations of notes on the piano. I'm glad no one scheduled me into constant activity and that my parents did not have all-day electronic access to my grades and that they were only slightly involved in my school activities. Overall, I am glad that my past is a memory, dotted only with a few films and a few wrinkled photos and that it lives, more vividly, in stories told by voices that were there. There was quiet of the mind and of the ears. There was "boredom" and there was space. There are many great things, now, but I am glad those great things were not there when I was a boy and when I was a young man. I am grateful for these things and no one can "argue" that away from me. It's not a prescription for everyone else; it's how I feel and what I prefer. It is good to have a childhood that feels like home. An anti-technological meme posted to Facebook is interesting in itself. But when it includes pictures of bicycles under streetlights and children in mass-produced clothing it becomes more curious still. Irony aside, George, I think the emphasis of the meme is in the idea of technology having "taken over" -- a time before technology became an obsession. Of course, technology has really always existed -- even in ancient times. 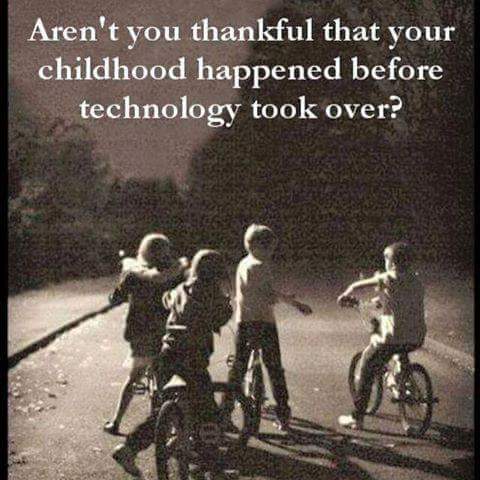 But, as a kid, technology existed as a fairly unnoticed presence for me. Now, it is the desired possession and the flooding of the mind.